Here is a list of Madrid subway ticket prices for 2019. 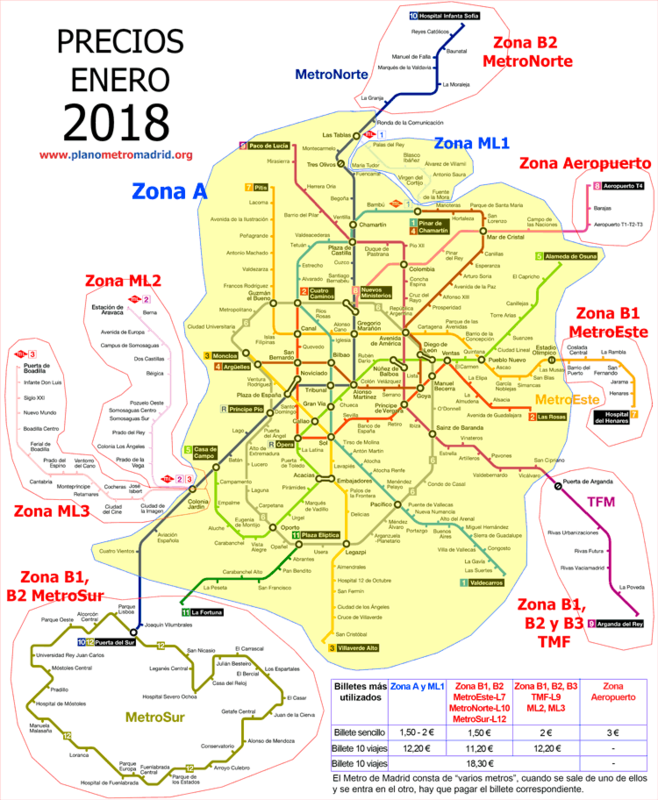 Purchasing a ticket for transportation in Madrid can be very complicated because the price depends on the line you use, the number of stations that want to travel and the company that owns the corresponding line. Single ticket (zones A and ML1) 1,5 to 2 Euros The ticket costs a minimum of 1.5 € and the price increases with the number of stations to a maximum of 2 €. 10 or more stations 2€. Allows for only one trip between selected stations. Allows only for travel from one station to another within zone A or ML1 (they call it "ML1 metro" or "metro ligero" -light metro, LRT- but is actually a tram). Combined single ticket (all zones except airport) 3 Euros With this ticket you can travel from any metro station to any other, in any zone. The only exception being, that it is not valid for travel to the airport, which costs extra). Bus travel card 10 (zone A, zone and bus ML1 EMT) 12,20 Euros The 10 ticket costs € 12.20 and is valid for 10 trips from any metro stop to any other. Valid only in subway stations that are in zone A or ML1 (tram). This ticket may also be used in urban EMT buses. The price of this 10 ticket pack is 12,20 Euros, so each trip costs € 1.20. Combined ticket for 10 trips 18,30 Euros This ticket costs € 18.30 and is valid for 10 journeys from any subway stop any other, is the place that is. The only exception is that you can not use to go or return to the airport. To our knowledge, can not be used in urban buses EMT. The price of this 10 ticket pack is 18.30 Euros, so each trip costs € 1.83. 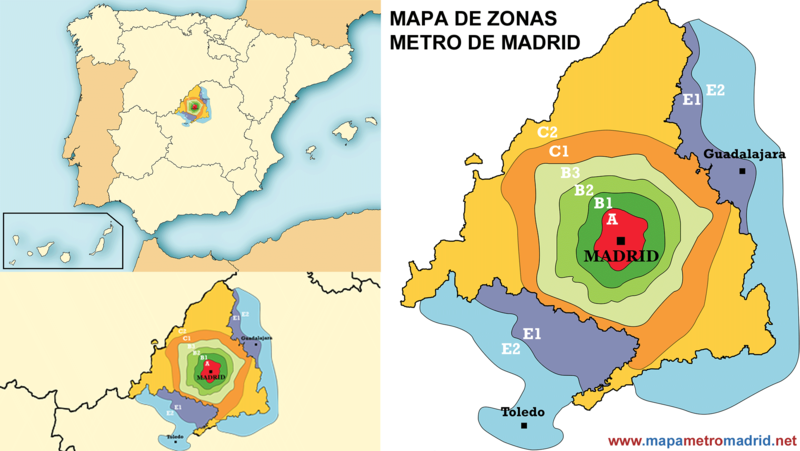 To understand the prices, onr must understand that the Madrid metro really is "several metros" that have been connected together, and when one gets exits one and enters the other, you have to re-pay the trip according to the money you have. Where to buy tourist tickets online? On the website of TicketBar, you can buy cheaper tickets for all kinds of museums, shows, monuments, attractions, and more places in Madrid. In some things (few) you can save up to 20%. In most places, with these tickets you will not queue at the entrance (skip the line). •	The most obvious place is in the machines in the metro stations that allow payment by coins, banknotes and even credit cards. All machines have touchscreen and are easy to use. •	The next place would be the following station platforms: Puerta de Arganda, Tres Olivos and Estadio Metropolitano. •	Finally, in the passage barrier of the Metro station "Puerta del Sur". Why is pricing of Madrid Metro tickets so complicated? We don't know. But legend has it that years ago, a senior Metro Madrid official conjured up the devil and asked him to invent tariffs to drive people crazy, hence the current prices of the Madrid metro came into being. To complicate matters further, one price was made for the 3 zones (B1 B2 and B3) + the TFM metro pack and another for the B1 and B2 zone + MetroSur pack. To top it off, in the world of urban transport the a tram is a "tram”. In Madrid however, it was deemed a "light rail". Since then millions of people roam the streets of Madrid in a zombie like state, cursed forever to wandering, and eating brains. We hope that with our maps and the above data, you can travel around Madrid, happily understanding at all times how much the fare is, without becoming a zombie. Do children have to pay fare? All children under 4 travel free. If you detect a failure or modification, please contact us, so we can fix it asap. Thank you very much for your visit, we hope our listing of fares airline and Madrid Metro fares has been helpful to you.